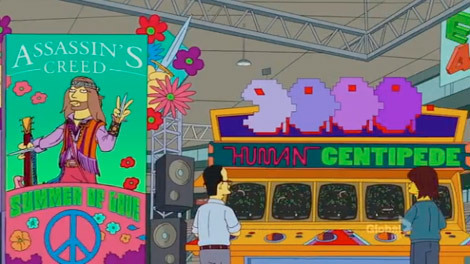 The Simpsons Skewer Videogames at "E4"
Homer and family visited the Expensive Electronic Entertainment Expo last weekend. It's OK to admit that you haven't watched a Simpsons episode in a while. I used to watch the show incessantly in college, but that was the 90s and the internet hadn't yet provided us with non-stop hilarity. Despite unresolved conflict between the six major voice actors and the Fox network over salaries, The Simpsons is in its 23rd season and still going strong satirizing all facets of our culture. The bulk of last Sunday's episode "The Food Wife" makes fun of foodies, but the opening segment has Homer, Bart and Lisa attending E4 to see the latest game titles like Grand Theft Scratchy: Itchy City Stories, Dig Dug Revelations, Earthland 2: The Outing of the Realms, Shaun White: Time Snowboarder, World of Krustcraft, TMTOMO, HTMFL, and DL2L2D. I haven't seen the episode - damn my wife for setting the DVR to record Sister Wives instead - but these pictures are all spot on. 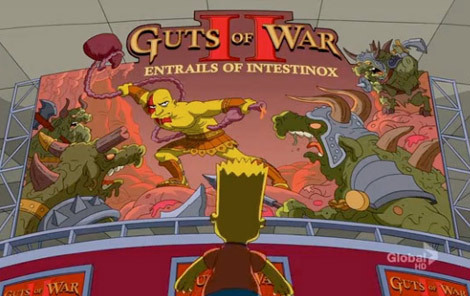 I would totally play Guts of War II: Entrails of Intestinox. 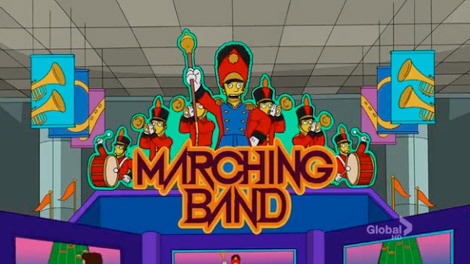 The funniest bit was Marching Band. The concept of a Kinect game where you march in rhythm to John Philip Sousa while holding a tuba is just plausible enough to be real. It's just icing on the cake that the game actually makes you study for 12 hours on the bus-trip back home. What an accurate simulation of being in band! Oh Simpsons, maybe you are still funnier than Family Guy and South Park. Maybe.